Congratulations to Nina Skilton who won the W50 title in the North Staffs Cross Country League following the cancellation of the final meeting of the season at Staffs University on Saturday. Excellent performances in the previous three meetings meant Nina finished well ahead of her rivals. If you do train at the track anytime from 24th December to the 1st January, please remember that these are not club nights so you have to pay the Rangers for use of the track. The throwing area is not to be used outside of supervised hours. Under no circumstances should throwing take place without first obtaining the authorisation of site staff. After my first year as Chairman, I must start my report by thanking all the people who volunteer their time, free of charge, to enable the club to run smoothly and the athletes to enjoy their sport. As a club, we are fortunate to have Committee members who are excellent at their roles and it has certainly made life a lot easier for me knowing that I don’t have to worry about the administration side of the running of the club. Many of our coaches turn out in all weathers to train, encourage and support their athletes, travelling all over the Country to watch them striving to achieve their goals. Our small group of dedicated officials regularly attend club meetings (almost always the same ones) so that our athletes are able to compete and there are a number of other people that volunteer by assisting training groups, organising and managing teams, collecting money on training nights etc, etc. Thank you all. It has been a pretty successful season for a number of our athletes. I was an extremely proud Dad with Nat being one of five C&S athletes who earned an invitation to compete in British Championship competitions. The others were Gabi Burton, Megan Davies, Bethan Rees and Olivia Walker. Meg was also selected to represent England U20s during the season and Beth threw for Wales. We had thirteen athletes selected to represent Staffordshire at the English Schools Cross Country Championships, eleven at the English Schools Track & Field Championships, Meg, Nat and Chloe Wilde represented Staffordshire at the Senior Inter Counties and Bill Chesters represented the North at the School Games. Excluding the vets, we had three that won medals at National Champs (Meg, Beth and Amy Pye) and we also had a World Champion with Carl McMullen winning his age group in the World Icosathlon Championships (double decathlon). A number of our athletes also won medals in Midland and County Championships both in track & field and cross country. On a team front, unfortunately we weren’t quite as successful. Our Men’s Veteran team won their division against stiffer opposition than normal but our U17/U20s were relegated from the UKYDL Premier Division and our Senior team was relegated from the top division in the Midland League. One of the few things I have been disappointed with this season is the turn out of athletes in the U13/U15 age group in the YDL. Athletes are accepted into the Development Group to be trained to compete for the club. We know that there are always legitimate reasons why certain individuals can not compete at certain meetings but I don’t think some parents or athletes realise that, whilst the athlete is an individual in their own event, each individual is still part of the Cannock & Stafford AC team and, if they were not willing to contribute for three meetings a year, they are depriving a waiting list of athletes of the opportunity! I hope those competing in the cross country events have a good end to the year and wish everyone a happy and healthy Christmas and New Year. Cannock & Stafford AC's AGM will take place in the Function Room at Rowley Park at 8pm on Thursday 7th December 2017. The meeting will receive the annual report of the clubs activities in 2016/17, as well as the audited accounts. This will be followed by the election of members to fill vacant positions. These are Vice Chairman and Treasurer. Please complete the nomination form on the attached agenda for anyone willing to stand for the vacant committee positions. Please note the Vice Chairman and Treasurer role is a 2 year tenure. As the Chairman and Secretary are half way through their term in office these positions are not up for election until the AGM 2018. Cannock & Stafford's Senior Men's Cross Country team began their attempt to regain their Division One status with second place in the first meeting of the season at Lilleshall on Saturday (11th). Chris Perrin convincingly won the race by 22 seconds and Phil Wolfe finished fifth, just over half a minute behind his team mate. There was only 2 seconds between James Perrin and Nigel Haycock in 16th and 17th respectively and Craig Pearson came 30th. Aiden McCormack finished as the final A team scorer in 44th. Greg Beech came home in 52nd and Sam Bagley 58th. Sam's position was enough to place him in 6th place of the Junior Men. Tim Kelly was 70th, Tom Orton 85th and Pedro Havelock 181st of the 288 finishers. Nina Skilton came 44th in the first Midland Women's Cross Country League meeting of the season at Coventry on Saturday. Georgia Chattwood finished 57th, Sue Kneill-Boxley 87th and Becky Brown 107th. Congratulations to Nigel Haycock who has been selected as second reserve for the England team competing in the British & Irish Masters International Cross Country. The meeting takes place at Gransha Park in Derry on 18 November. It was a good day for our Men's Cross Country Relay teams in the Midland Championships as both the Senior and Masters Men came home with medals. Nigel Haycock led off the Master's team and finished the first leg in third place in a time of 22:45. Jason Jones (23.15), Tim Kelly (23.28) and Paul Thacker (24.11) maintained this position, out of the sixteen full competing teams, to win bronze medals. There were 56 complete teams competing in the Senior Men's race. Phil Wolfe finished the first leg in eighth place (21.33) and Chris Perrin (20.24) pulled the team into medal contention, handing over to brother James in second position. James ran a 22.45 leg leaving Sam Bagley in third at the start of the final leg. Sam battled with the Cheltenham athlete but, despite running 22.20, was beaten into fourth in a sprint finish. However, as only the top one of each club's sides counted for medal positions (and Tipton finished 1st and 2nd), the lads were awarded the bronze medals. Our Senior Women's A team of Katie Lord (25.48), Becky Brown (30.36) and Giorgia Chatwood (27.16) came ninth out of 24 complete teams and the B team of Rachel Jones (28.40), Libby Dunne (29.39) and Natalie Boswell (31.44) came forteenth. The C&S Masters's Women just missed out on the medals, finishing fourth. Sally Gray (26.20), Nina Skilton (26.51) and Sue Kneill-Boxley (29.08) finished just over a minute behind the W&B team. With Christmas approaching, a lot of you will be shopping online and there is a FREE way that you can contribute towards the Club's funds. If you shop online, please register to support the club through the Easyfundraising site. It won't cost you a penny more for your purchases but the club gets a donation from the people you are buying from. Click on the green button saying "Sign up for free and support this cause"
The Cannock & Stafford AC U17 Men’s team won bronze at last weekend’s Midland Road Relay Championships at Sutton Park. In a race that started with 33 teams, Josh Ward ran the first leg in 12:14 and handed over to Zach Parton in second place. Zach ran the sixth fastest second leg (12:57) and handed over to Bill Chesters with the team still in second. Bill also ran the sixth fastest third leg (12:53) to bring the team home in fourth place but, with only the top team from each club counting for medal positions and Charnwood having two teams in the first three, the C&S lads took the bronze medal position. Our U15 Girls team came 24th out of 45 teams starting. Thando Hart came seventh on the first leg in 15:00 and Ella Sandy (17:46) and Amani Williamson (18:25) brought the team home. The C&S U15 Boys came 30th of the 45 teams that started the race with Christian Roe clocking a 15:33 leg, Thomas Lemmon 15:56 and Thomas Brownsill 15:34. There were 119 teams starting the Senior Men’s race and Craig Pearson (21:03) handed over to Bradley Haycock in 48th place. Bradley gained four places with a 20:49 leg and James Russell a further place with 21:41. Sam Bagley maintained 43rd position with a 21:55 leg before handing over to Chris Perrin who then ran the third fastest of all of the fifth leg runners (18:25) to move the team up to 27th. James Perrin finished the final leg in 20:54 to give the team a 28th place finish. Our Senior Women’s team came an impressive 18th out of 117 teams that began their race. Sally Gray led the team out with a 17:02 leg and handed over to Giorgia Chattwood. A 17:45 leg from Giorgia gained the team a place and Rachael Jones maintained the team’s position with 19:08. Nina Skilton then ran a 17:33 final leg to lift the team the 18th. Carl McMullen became the M35 World Icosathlon Champion at the competition held in Belgium at the weekend. The Icosathlon is a double decathlon with ten events on each of the competition days. Carl began the competition with a vet's club record run of 11.52 in the 100m and followed this with a 6.12m long jump, a 26.72 in the 200m hurdles and a shot put throw of 9.04m. He then completed the 5000m in 21:09.01 before the athletes are allowed a one hour break. The next event was the 800m where Carl ran 2:16.43 followed by the high jump where he cleared 1.50m. A remarkable 53.39 in the 400m and a 14.70m hammer throw led to the final event of the day, the 3000m steeplechase. Carl completed this in 13:14.62. Day 2 began with the 110m hurdles which Carl completed in 17.16. He threw 24.34m in the discus, ran 23.63 in the 200m, cleared 2.40m in the pole vault and then completed a 3000m in 11:53.33. After an hour's break, Carl ran a 60.31 400m hurdles, spiked a javelin 10.26m and then ran 5:08.51 in the 1500m. His triple jump of 11.77m was his nineteenth event in under two days and to complete the competition, Carl had to run a 10,000m race which he did in 46:20.93! Congratulations Carl. A Cannock & Stafford AC World Champion!! Amy Pye and Josh Ward both reached National finals on the first day of competition at the England Athletics U15/U17 Championships in Bedford. One of Amy's main rivals for a medal in the 300m hurdles, Sophie Porter from Guernsey, was disqualified for a false start in their heat but Amy appeared unaffected as she comfortably won in 44.69 to reach Sunday's final. Charlie Peters ran her fastest ever 100m of 12.80 to finish fifth in her heat and Bill Chesters came tenth in the 1500m steeplechase final in 4:42.68 before Josh Ward grabbed the final fastest loser spot to qualify for Sunday's 1500m final with a pb of 4:01.74. On day 2, Amy Pye took gold in the 300m hurdles. Not only did her time of 41.96 smash her pb by over a second, it also broke the club record which had stood since 1988. Following her victory, Amy still had the 80m hurdles to compete in. After qualifying through her heat (11.44 - 3rd) and semi-final (11.47 - 4th), she hit the third from last hurdle in the final and was unable to balance herself to take the penultimate barrier. Josh Ward ran his second pb in as many days and also broke through the four minute barrier to finish seventh in the 1500m final in 3:59.42. Amy Pye broke the Championship record for the 300m hurdles to win gold at Nuneaton on Saturday (19th). Amy's time of 43.06 was also a pb, knocking 0.3 off her previous best. On Sunday, Amy also ran a wind assisted pb of 11.28 to win silver in the 80m hurdles after also finishing second in her heat. Josh Ward also took home a gold medal after dominating the 800m, coming home in 1:57.69. Harrison Hardy-Smith won bronze in the same race with an excellent run of 2:02.97. Harrison had also competed in the 1500m on Saturday where he came sixth. Bill Chesters won bronze in the same race in a pb of 4:10.10. It was a good weekend for Bob's athletes as Allegra Soutar also took home a bronze medal from the 1500m where she finished in 5:00.77. Jayden Moore ran a pb of 2:32.58 to finish 5th in his 800m race. Cara Brown and Jack Turner were also bronze medal winners. Cara cleared 2.40m in the pole vault whilst Jack's throw of 49.64m in the hammer was his second longest ever throw. Elsewhere, Charlie Peters came sixth in the long jump with 5.01m and reached the final of the 100m by finishing second in her heat in a wind assisted season's best of 12.87. Her sister, Millie, came 10th in the javelin with 22.84m. Ross Goode ran a wind assisted pb of 12.07 in his 100m and clocked 25.10 in the 200m and Cameron Futers ran 12.10 in the 100m and 25.35 in the 200m. Libby Moore also ran a wind assisted pb of 13.57 in the 100m and finished her 300m heat in 44.54. Abigail Clark took part in the U13 Quadrathlon and performed excellently with a 3.99m pb in the long jump, 14.60 in the 100m, 2:15.28 in the 600m and 5.05m in the shot. There was only one scenario which could see us relegated from the top division in Midland senior athletics. Notts had to win the meeting and C&S had to finish last and, unfortunately, that was the way things played out. With no national league fixtures taking place on the same weekend, four of the other clubs brought stronger than normal teams to provide tough opposition for our athletes. In the women's 400m hurdles, Birchfield had two entrants from the recent British Championships taking part but Natalie Ainge rose to the occasion to knock 0.9 seconds off her pb and win the A race in 62.2 secs. In the B, Chloe Wilde came second in 64.6. Chloe also won the B 100m hurdles race in 18.0. James Russell had a busy day and started well with a 400m hurdles pb of 64.1 and Steve Thompson, making his first appearance for two years, came second in the B long jump with 5.62m. It was a really successful day for our 800m runners with Josh Ward winning the A race in a pb of 1:56.3 and Iris Davies and Rebecca Brown also running pbs of 2:22.5 and 2:26.9 respectively. With sprints taking place into a strong headwind, Megan Davies came second in the 100m (12.7) and first in the 200m (25.7) and Hannah Malpass came second in the 200m B in 26.9. Amy Pye, taking part in only her second 400m race, won the B in 59.8. Rain threatened throughout the day but the biggest downpour came just as the men's 3000m race started but this didn't stop Chris Perrin from winning in an excellent time of 8:48.1. Jak Carpenter threw 13.31m to finish second in the shot and the women's 4x100m relay team of Nat, Meg, Chloe and Hannah ran through the puddles to finish second in 50.1. The 4x400m relay team (Chloe, Becky Brown, Amy and Meg) had a terrific victory in their race, clocking 3:59.4. Three Cannock & Stafford athletes took part in the European Masters Championships in Aarhus, Denmark. On Sunday, Craig Pearson came 12th in the M35 4k Cross Country race and then, on Thursday he came 8th in his 5000m race and 17th overall with a time of 17:03.15, just outside his season's best. Nina Skilton also took part in the 4k Cross Country in the W50 category, finishing in fifth position. Unfortunately, Les Green had to pull out after three miles of the M75 half marathon as he felt he had no chance of achieving the cut off time allowed. Bethan Rees and Rebecca Scott competed in a EAP meeting in Portugal on Saturday and Sunday. 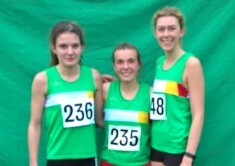 Megan, along with Natalie Ainge and Chloe Wilde, represented Staffordshire in the competition which doubles as the CAU Inter-County Championships. Both Nat and Chloe ran in the 400m hurdles, Nat finishing sixth in her heat in 63.66 and Chloe Wilde eighth in her heat in 65.92. The Cannock & Stafford AC Senior team came third in the penultimate league meeting of the season at Yate on Sunday (16th) to give themselves a fighting chance of maintaining their place in the Midland's top division. Our women 400m runners have won every Midland League race that they have took part in this season and this meeting was no exception. Megan Davies won the A race in 58.25 and Natalie Ainge the B race in yet another pb of 57.68. We also gained maximum points in the women's 400m hurdles with Nat winning the A race in 63.70 and Chloe Wilde the B race in 65.02. Chloe came second in the 100 hurdles A in her first attempt at the event in 16.34 and Nat won the B in 16.48. Nat also won the B long jump with 4.85m and threw a pb of 21.13 in the discus. Our men's hurdlers also got in on the act with Alasdair Rigby finishing second in the A 400 hurdles and 100 hurdles (60.13/16.44) and Rodders finishing second in the B events (66.31/21.30). Cara Brown won the pole vault, clearing 2.40m whilst her older sister, Rebecca, ran a pb of 2:27.76 in the 800m. Amy Pye came second in the 100m in 12.41 and Allegra Soutar knocked almost six seconds off her 1500m pb to run under five minutes for the first time (4:59.78). Jak Carpenter won the shot with 13.24m and, in the 1500m, Josh Ward came second in the A race in 4:10.51 and Zach Parton won the B race in 4:18.61. James Russell finished second in the 2000m steeplechase (6:42.65) with Sam Bagley winning the B race in 6:46.73. Carl McMullen broke the club's M35 200m record with a time of 22.93, Isaac Lewis ran a new 100m pb (11.87) and Josh Richards jumped 11.90 for a new triple jump pb. Charlie Peters made her debut for the senior team and recorded 4.86m in the long jump and 26.96 in the 200m B race. On a warm evening in Cardiff, Bethan Rees took victory in the U20 International fixture with a throw of 46.13m. Beth was throwing for Wales U20s and was only beaten by a guest athlete, Laura Wittingham of Sale Harriers, who threw 50.37m. Bethan Rees and Megan Davies both picked up medals on the second day of the English Schools Championships at Alexander Stadium. Beth threw her second furthest distance ever (48.80) to comfortably win gold in the Senior Girls javelin after picking up the Intermediate Girls title last year. Team captain Megan Davies, won her heat of the SG 400m in 56.04 and then ran her second fastest time ever to win bronze in the final in 55.87. There were a number of C&S athletes taking part in their first English Schools. Jack Turner's continued improvement this year led to him achieving the entry standard and he was rewarded with his selection in the team. In the Inter Boys hammer final Jack threw 46.91 to finish 15th. Bill Chesters came 11th in the IB 1500m steeplechase in 4:38.95 and Becky Lawley came 10th in her Inter Girls long jump pool with 4.81m. Josh Ward came 4th in his IB 800m heat in 1:58.23, Emily Belton 6th in her Inter Girls 200m heat with 26.18 and Chloe Wilde 5th in her SG 400m hurdles heat in a time of 65.89. Amy Pye came 3rd in her IG 300m hurdles heat in 45.68, Dan Fitzhenry 9th in the SB high jump with 1.94m and, in a SG 1500m steeplechase race with possibly too many athletes taking part, Katie Lord fell at an early barrier but continued to finish in a time of 5:31.23. Congratulations to the eleven Cannock & Stafford AC athletes who have been selected to represent Staffordshire at the English Schools Championships at Alexander Stadium on the 7/8 July 2017. Martin Roberts, Craig Pearson, Shaun Ainge and Terry Faulkner all represented Midland Masters and Carl McMullen represented the Northern Veterans at the Inter-Area Challenge meeting at Solihull on Sunday. Carl broke another two club M35 records when he won the long jump with 6.30m and came third in his 400m race in 51.5. He also won the 200m in 23.2 and the triple jump with 12.12m. Craig came second in the M35 1500m with a time of 4:25.0 and Martin Roberts came second in the M50 hammer with 37.06. Terry had a third place finish in the M70 200m (35.1) and Shaun finished third in the M50 400m in a season's best 59.1. Midland Masters comfortably won the eight team competition. Four Cannock & Stafford AC athletes were invited to take part in the British Championships that took place at Alexander Stadium last weekend (1/2 July 2017). Three of the athletes were due to compete on Saturday. Natalie Ainge performed well and came seventh in her 400m hurdles heat in a time of 63.85 in the event that was finally won by Olympian, Eilidh Doyle. Olivia Walker ran her second fastest time of the season (14.56) to finish seventh in her 100m hurdles heat behind the eventual silver medallist, Yasmin Miller and Gabi Burton unfortunately had to withdraw from the same event, on the day of the competition, due to injury. On Sunday, Bethan Rees broke the club's U20 javelin record with a throw of 49.56m to finish in a magnificent 4th place and lift her to sixth in the Senior UK rankings. Carl McMullen led the way for C&S athletes at the British Masters Championships at Alexander Stadium last weekend (24/25th) by winning gold in the M35 400m hurdles with a blistering time of 57.90. Paul Edwards added another two British medals to his impressive collection with silver in the M55 100m hurdles (16.99) and bronze in the 400m hurdles in 69.68. Emma Hollinshead was another double medal winner with bronze in the W45 400m in 67.14 and silver in the 800m in 2:34.67. Two other C&S athletes took part in the Championships. Martin Roberts won bronze in the M55 hammer with 42.92 and he also threw the M55 11.34Kg weight 12.20m and Stephen Terry-Short ran 13.17 in the M45 100m. Eighteen Cannock & Stafford athletes represented Staffordshire Schools at the Mason Trophy at Alexander Stadium on Saturday (17th) and three of them came home with medals. Amy Pye won two medals, gold in the IG 300m hurdles in 44.27 and silver in the 80m hurdles in a season's best 11.66. Emily Belton took bronze in the IG 200m in 25.61 and also ran 12.74 in the 100m and Bill Chesters won a silver in the IB 1500m steeplechase in 4:36.91. In the discus, both Jack Turner (IB) and George Bardell (JB) just missed out on medals finishing fourth with 35.12m and 33.92m respectively. Jack also threw in the hammer, recording a throw of 46.55m. Isaac Lewis jumped 5.95m in the IB long jump and Charlie Peters (4.99m) and Becky Lawley (4.90m) took part in the IG event. Charlie also ran 12.91 in the 100m. Cara Brown cleared 2.50m in the pole vault. The 200m races saw Fadia Hashish (IG) take well over a second off her pb to finish in 26.78 and Charis Farmer also ran a pb in the IG race (26.96). Sydney Davies ran 27.79 in the JG 200m and 12.41 in the 75m hurdles. Joe Taylor (15.43) and Nathaniel Sackey (15.78) both ran pbs in the IB 100m hurdles and Nathaniel also cleared 1.65m in the high jump. Beth Rees won a silver medal at the National U20/U23 Championships in Bedford on a scorching Saturday afternoon. Her throw of 48.60m beat her previous best by almost 1m. Four other C&S athletes were in action over the weekend. Chloe Wilde finished sixth in her 400H heat in a time of 65.11 and Megan Davies missed out on a place in the 400m final by 0.05 seconds after finishing third in her heat. On Sunday, Olivia Walker ran a season's best of 14.38 in the 100m hurdles, finishing fifth in her heat and Katie Lord came 5th in the 3000m steeplechase in 12:20.38. Natalie Ainge, Gabi Burton and Katie Lord all won gold medals at the Midland Championships in Nuneaton on Sunday. Nat won her gold in the SW 400m hurdles in a time of 64.17. In a combined U20 / Senior race, she finished just behind team mate Chloe Wilde, who took silver in the U20 race with a pb of 63.91. Katie Lord also recorded a pb on her way to winning the 2000m steeplechase in 7:32.46 and Gabi Burton took full advantage of the winds that were benefiting the sprinters to win the SW 100m hurdles in 13.90. Gabi also ran 12.15 in the 100m. Beth Rees and Megan Davies won silvers in the javelin and 400m respectively and Chloe Lindop ran 12.66 in the 100m and 25.84m in the 200m. Our only male athlete competing was James Russell who came fourth in the 3000m steeplechase in 11:07.27. Three C&S AC athletes won two individual events at the County Schools Championships at Northwood on Saturday (10th). Jack Turner threw a pb of 51.98m to finish first in the hammer and also won the discus to continue his good form this season. Emily Belton dominated the Intermediate Girl sprints by winning her heats and finals in both the 100m and 200m and Amy Pye won the 300m hurdles and 80m hurdles. Allegra Soutar continued to impress with a win in the Inter Girls 1500m in 5:06.9. Fadia Hashish had an excellent victory in the Junior Girls 200m and Sydney Davies won the JG 75m hurdles. Also in the hurdles, Joe Taylor won the Inter Boys race. Nathaniel Sackey, who came second to Joe in the hurdles, won the high jump with a 1.70m clearance and Dan Fizhenry won the Senior Boys competition with 1.90m. Our high jumpers were in fine form with Thando Hart also winning the Junior Girls event with a 1.45m jump. Cara Brown had a 2.51m pb clearance in the pole vault and Isaac Lewis won the Inter Boys long jump with 5.76m. George Bardell won the Junior Boys discus and Rebecca Scott threw 28.69m to win the Senior Girls javelin. Congratulations to all of our other athletes that finished in the top two places to earn a place representing Staffordshire at the Mason Trophy next week. Bethan Rees won the Senior Women's Javelin competition at the Welsh Championships in Cardiff on Saturday. Beth has now won the Welsh Championships at all age groups from U13 to Senior. The Cannock & Stafford Senior team came fourth in the Midland Senior League Division 1 meeting at Alexander Stadium on Sunday (4th). Megan Davies (55.96) and Natalie Ainge (57.89) came first in the 400m 'A' and 'B' races respectively. Nat's time gave her a ninth pb of the season and she later followed this with a tenth in the discus. Josh Ward gained a 800m pb, finishing second in the 800m in 1:56.91 and Harrison Hardy-Smith won the 'B' race in 2:00.02, also a pb. In the women's 800m, Katie Lord was another to run a pb, coming home second in 2:21.63 and Allegra Soutar smashed her pb by almost 4 seconds to win the 'B' race in 2:25.12. Allegra also ran a 1500m pb (5:05.71) to finish third in the 'A' race. Chris Perrin's first track appearance for almost 5 years saw him win the 3000m in 9:00.05 and Ryan Ashforth came second in the 3000m steeplechase 'A' with a pb of 10:56.94. James Russell won the 'B' race in 11:02.22. Dan Fitzhenry cleared 1.95 to win the high jump, Chloe Wilde comfortably won the 400m hurdles 'B' race and Sally Gray came first in the 'B' 3000m. Our 4x400m team (Chloe Wilde, Chloe Lindop, Amy Pye and Megan Davies) were easy winners of their race, coming home in 4:03.21. There were a few athletes making their debut in our Senior team. Rebecca Scott came third in the javelin (27.68), Sarah Armstrong fourth in the 3000m (11:04.88), Emily Belton third in the 200m (26.15) and Isaac Lewis fourth in the long jump with 5.99m. The result leaves Cannock & Stafford in third place in the overall Division One standings after two meetings. Cannock & Stafford AC athletes had a successful day at the Midland Masters Championships in Nuneaton on Sunday (4th). Paul Edwards ran a Championship Best Performance of 16.7 to win gold in the M55 100m hurdles. He also won gold in the 400m (61.4) and bronze in the 200m (27.5). Terry Faulkner won three gold medals in the M75 100, 200 and 400m races (16.3, 33.4, 87.2 respectively) and Stephen Terry-Short won gold in the M45 100m in 12.6 and 200m in 26.4. Stephen also came second in the 400m in 62.1 but was outside of the time needed to be awarded a medal. Emma Hollinshead took home a medal of each colour with gold in the W45 400m (67.7), silver in the 800m (2:40.3) and bronze in the 200m (31.2). In the middle distance events, Sue Kneill Boxley won gold in the W50 800m with a time of 2:49.3, Tim Kelly won the M45 800m in a time of 2:14.6 and Nigel Haycock won gold in the M45 1500m in 4:32.6. As weather conditions for an athletics meeting go, you couldn't have got much better than those on Sunday for our YDL meeting at Rugby and our athletes took full advantage with plenty of excellent performances. Chloe Wilde was the first of our individual event winners, comfortably coming home first in the 400m Hurdles in 64.7 and Amy Pye followed shortly afterwards in the 300m (45.2). Amy later also won the 80m Hurdles in 11.8. Nathaniel Sackey ran pbs in both the 400H and 100H (64.5 and 16.4) and Josh Ward and Harrison Hardy-Smith treated us to an entertaining 1500m race with Josh winning the 'A' race in 4:07.1 and Harrison the 'B' race in 4:12.6, both pbs. Chloe Lindop won the 'B' 100m race in 12.9, Josh Richards ran pbs in both the 400m (52.4) and 200m (23.8) as did Joe Porter (56.0 and 24.3). Hannah Malpass came second in the U20W 400m in 59.7 and Issey Kelly took chunks off her 300m and 200m pbs with runs of 42.4 and 26.5 respectively. Megan Davies (25.2) and Emily Belton (25.5) both came second in their 200m races and Iris Davies recorded a pb of 2:22.9 to finish third in the U17W 800m. Giorgia Chattwood came second in the 3000m 'A' race in a pb of 11:15.0 and Libby Dunne won the 'B' race in 12:14.5. Our steeplechase runners did well with Katie Lord finishing second in the U20W 1500m S/C in 5:19.5 and Bill Chesters second in the U17M 1500m S/C in 4:39.5. Sam Bagley came second in the U20M 2000m S/C 'A' race in 6:42.2 and Ryan Ashforth won the 'B' in 7:23.0. On the field, Becky Lawley and Charlie Peters won the 'A' and 'B' U17W long jump with 5.04m and 4.77m respectively, Dan Fitzhenry finished second and Mark Hawkins first in the U20M long jump 'A' and 'B' (5.89m and 5.40m) and Isaac Lewis second in the U17M long jump (5.89m). Dan also won the high jump with a clearance of 1.95m. Jack Turner came second in the U17M shot (10.96m) and won the discus (33.63m) and Cara Brown finished second in the U17W pole vault, clearing 2.30m. The County Championships were held on Saturday at Aldersley Stadium, Wolverhampton as part of Wolverhampton & Bilston’s 50th Anniversary Celebrations and, as usual, it was a successful meeting for Cannock & Stafford AC with the club winning 21 gold medals. It was an excellent day for Jack Turner in the U17M age group. Jack threw pbs in each of the shot (11.44m), hammer (47.85m) and discus (35.35m) to take home three gold medals. The track events started well. Amy Pye won the 300m hurdles in 44.3, Chloe Wilde won the U20W 400m hurdles with a new Championship Best Performance of 64.8 and Natalie Ainge won gold in the SW 400m hurdles with a new pb of 63.4 seconds. This was Natalie’s seventh pb of the season in five different events. Josh Ward’s first 800m run of the season ended with a first place finish in the U17M race in a time of 1:59.3. Josh’s pace also helped to pull team mate Bill Chesters, who finished second, to his first sub 2 minute 800m. Amy Pye won her second gold of the meeting in the 80m hurdles in 12.0 and Joe Taylor ran a pb of 15.9 in the U17M 100m hurdles to also finish first. Sam Bagley won the U20M 2000m steeplechase in a new pb of 6:36.0 and Paul Lester won the SM race in 7:28.8. The C&S female sprinters showed their prowess over 100m with Sydney Davies winning the U15 race in 13.4, Charlie Peters the U17W in 13.1 and Chloe Lindop the U20W event in 13.2. The U20W 400m was a close race with all three competitors separated by just one tenth of a second. Leah Aldred, in her first run over the distance, just held on to win in 64.9 with fellow C&S athlete, Charlotte Hall, third in 65.0. Mia Wainwright ran a brilliant 200m to win U13G gold in 30.9 and Emily Belton easily won the U17W 200m in 25.9. The Cannock & Stafford javelin throwers enjoyed the competition. Rebecca Scott won the SW event with a pb of 30.83 and Bethan Rees the U20W with a season’s best throw of 44.97. Abigail Clark took gold with a 1.25m jump in the U13G high jump and Josh Blakesley won the U13B long jump with 3.98m. It was great to see the large number of C&S athletes who competed at the event and well done to those not mentioned who won silver and bronze medals or achieved pbs. There have been a number of questions raised regarding the results of the YDL meetings held so far this season as they have not yet appeared on the Powerof10. The current situation is that there are results listed on both the UKYDL site and Topsinathletics. Unfortunately, these results contain a number of errors due to problems with the results programme that the YDL are trying to sort. As a result, the Powerof10 are not listing any performances from the YDL meetings until these errors have been corrected by the league and results checked. This is obviously taking them some time and Bob and Shaun are continually chasing the league to get this dealt with as soon as possible. As you can see, it isn't just the divisions that C&S are involved in that are affected. It's frustrating for us all, especially those awaiting confirmation of PBs or standards, but the club is doing all it can to speed things up. Craig Pearson is enjoying life as a veteran athlete. After picking up a bronze medal in the British Masters Cross Country Championships only three weeks before, he repeated the achievement at the British Masters 10k Road Championships in Gravesend last weekend. Craig came third in the M35 age group (9th overall out of the 110 competitors) in a time of 36:02. Nigel Haycock came 4th in the M45 age group and 14th overall in 37:28 and Paul Lester finished 7th in the same age group and 31st overall with a time of 41:02. The three athletes excellent performances were rewarded with team gold in the M35 event. Les Green finally got his hands on a world medal after finishing third in the M75 half marathon in the race in Daegu, South Korea. The event is primarily an indoor one but also includes outdoor events such as throws, cross country and the half marathon. 78 year old Les had already competed in the 8km cross country (9th) and the 3000m (8th) before the half marathon. He completed the course in 3:07.27. Thirteen Cannock & Stafford AC athletes represented their counties on a flat, fast cross country course in the English Schools Cross Country Championships in Norwich last Saturday (18th). Sam Bagley finished 150th out of 324 competitors who completed the course in the Senior Boys age group. We had four athletes in the Senior Girls race out of 301 in total. Katie Lord was the highest placed in 62nd, followed by Rebecca Brown (159th), Rachael Jones (208th) and Libby Dunne (268th). There were 338 finishers in the Intermediate Boys where Bill Chesters came 155th and Connor Mills 282nd. Josie Nelson finished in 146th place out of 345 in the Intermediate Girls race and was followed home by Iris Davies (197th), Allegra Soutar (207th) and Jazmin Maddocks, who represented Shropshire, in 255th. Thando Hart had an excellent 96th place finish out of 344 in the Junior Girls race and Tom Brownsill came 291st in the Junior Boys. Congratulations also to Bob Hughes on another year as team manager for Staffordshire. Craig Pearson won a bronze medal in the M35 age group at the British Masters Cross Country Championships in Liverpool on Saturday (18th). Nigel Haycock just missed out on a medal after finishing fourth in the M45 race. Alongside Paul Thacker, who finished 12th in the same age group, and Paul Lester (14th), Nigel also just missed out on a another medal in the 45 to 54 team category, again finishing fourth. Christine Kilkenny was another C&S athlete that came so close to a medal, finishing fourth in the W60 race. There were a number of C&S athletes representing their County in the Inter Counties Cross Country Championships in Loughborough on Saturday (11th). Phil Wolfe came 222nd in the Senior Men's race and Katie Lord 66th out of 183 competitors in the U20W race. Harrison Hardy Smith came 97th of 294 runners in the U15B race and Thando Hart also came 97th (out of 295) in the U15G event. There were 282 finishers in the U17W race with Iris Davies coming home in 110th and Giorgia Chattwood 179th. Jazmin Maddocks, running for Shropshire finished 178th. Of the 263 athletes that completed the U17M race, Sam Bagley came 105th and Bill Chesters 154th. Thomas Brownshill took part in the U13B race and finished 158th out of the 297 athletes that completed the course. Recent Cannock & Stafford AC addition, Carl McMullen, won two gold medals at last weekend's British Masters Indoor Championships at Lea Valley. Carl took gold in both M35 long jump (6.18m) and triple jump (11.22m). He also took part in the 60m hurdles, where he came fourth in 9.12 secs, the 60m where he qualified for the final by finishing third in his heat (7.45) and sixth in the final (7.46) and the 800m (7th in 2:09.74). Paul Edwards added another silver to his haul of medals at UK level by clocking 10.25 in the M55 60m hurdles. Paul also came sixth in his 400m heat in 62.87. In her first appearance in an England U20 vest, Megan Davies won her 400m race at the Welsh International in Cardiff. In a race involving U20 and U18 women from England and Wales, Meg trailed the Welsh team captain, Lauren Williams, with 60m to go but a strong finish saw her overtake Lauren to win in a time of 56.89 seconds. Megan was also a member of the winning 4 x 200m relay team, helping England U20's to beat their Welsh counterparts in the overall match result. Following her silver medal at the National Indoor Championships last weekend, Megan Davies has been rewarded with her first England U20 vest for the Welsh International meeting in Cardiff on Sunday. Congratulations to Megan Davies and Amy Pye who bought home medals from the National Indoor Championships held in Sheffield at the weekend (25/26th). After winning her heat in 57.12 on Saturday, Meg won silver in Sunday's 400m final in her second best ever time of 56.02. Amy eased through from her heat by winning in 8.87, won her semi final in 8.84 and then moved through the field to equal her pb of 8.74 to win bronze in the final despite not having the best of starts. We had four other athletes taking part in the Championships. Charlie Peters ran an electronically timed pb to finish 6th in her 60m heat in 8.21 and Emily Belton came fourth in her 200m heat with 26.26. James Pountney ran well to finish fifth in his heat in 8.73, only fractionally outside his pb and Sydney Davies finished second in her heat to qualify for the semi final (9.53) before missing out on a final spot by less than a tenth of a second after finishing fourth in the semi in 9.39, only one one hundredth of a second outside her pb. Cannock & Stafford AC had five relay teams in action at today's Grand Prix meeting in Birmingham. The meeting began with our U13 girls team of Heather Law, Abigail Clark, Mia Wainwright and Daisy Aspinall finishing fifth in their race in a time of 2:08.97. The U13 boys followed and the team of George Stevenson, Josh Blakesley, Chris Bennett and Sullivan Davies came an excellent third in 2:04.54. Bethany Lewis, Fadia Hashish, Hannah Burney and Sydney Davies also came third in their U15G race with Syd just beating the Halesowen final leg runner on the dip to clock 1:56.03. Emily Belton, Megan Davies and Amy Pye all won gold medals at the Midland Indoor Championships at the Barclaycard Arena at the weekend. There was also a silver medal for Sydney Davies and a bronze for Isaac Lewis as well as plenty of other pbs for C&S athletes. Emily had a fantastic series of races. With a previous pb of 26.0, Emily ran 25.78 to win her heat and then ran 25.57 in both her semi final and final to come away with gold in the U17W 200m. Megan Davies, fresh from her first experience of running in a British Championships the previous day, controlled her semi final race and then burst away from the field with just over 100m to go of the final to win in 56.89. Meg had been joined in the final by Chloe Wilde who finished a close second behind Meg in the semi final. Chloe eventually finished sixth in the final. Amy Pye added another Midlands title to her list by winning the 60m hurdles in a time just outside of her pb and Sydney Davies came a close second in the U15G 60m hurdles final. Syd had previously gained a pb in the 200m heats by running 27.31. Isaac Lewis jumped brilliantly to win a bronze in the U17M long jump, leaping 6.01m to smash his previous best of 5.39. Aside from our medal winners there were more excellent performances from our athletes. Natalie Ainge further improved her 400m best by three quarters of a second, clocking 57.94 and Charlotte Hall ran 65.54 in her first race at the distance. Libby Moore and Issey Kelly both bettered their 200m bests running 27.61 and 27.22 respectively and Ross Goode lowered his 200m best to 24.93. Bethany Lewis knocked a second off her 200m pb recording 29.01 and Jayden Moore ran 29.29 in his race over the same distance. In the U17W long jump, we had three competitors, Becky Lawley, Charlie Peters and Issey Kelly with Becky jumping furthest with 4.99m and Josh Blakesley took part in the U13B Quadrathlon. On Saturday, there was a silver medal for Dan Fitzhenry who cleared 1.90m in the U20M high jump and a bronze for James Pountney who ran 8.69 in the U20M 60m hurdles. Allee Rigby just beat Rodders in the SM 200m heat (24.12 and 24.30 respectively) and Hannah Malpass made the final of the U20W 200m by running a fast 25.90 to finish second in her heat. Unfortunately for Hannah, she pulled her hamstring in the final, whilst well positioned coming off the final bend. Also, on the first day of the meeting, Joe Porter ran 57.36 in his first 400m race and Charlie Peters finished third in both her heat (8.23) and semi final of the U17W 60m to qualify for the final where she finished eighth. Abigail Clark also did well in the U13G Quadrathlon, clearing 1.25m in the high jump and jumping 3.09 in the long jump. In the final round of the West Midlands Young Athletes League at the Aldersley Stadium in Wolverhampton, Harrison Hardy Smith produced an excellent performance to finish third in the under 15 boys race. That was also the position that he finished in the overall standings for the season. Gabi Burton, Olivia Walker and Megan Davies were invited to take part in the British Indoor Championships in Sheffield at the weekend after achieving the necessary performance standard. It was great to see all three girls wearing their club colours at the event. Megan Davies was competing in her first Championships and finished fourth in her 400m heat on Saturday in a time of 56.56. Gabi Burton ran probably the best race of her life to finish fourth in her 60m hurdles heat and just miss out on a spot in the final by one place after clocking a time of 8.66. Olivia Walker also took part in the 60m hurdles, finishing 7th in her heat. The Senior ladies of Cannock and Stafford completed their cross country season in style when they became champions of Division 2 at the weekend after recording another fine victory at the University of Warwick in Coventry. After wins in the previous three rounds, C&S held a comfortable lead over their nearest rivals and with good performances from the team they were never threatened and for the first time they now look forward to competing with the best teams in the Midlands. Leading lady for the club was Alice Burnhope in sixth place followed by Katie Lord in tenth, these two were supported by Nina Skilton 18th, Sue Kneill-Boxley 25th and Rebecca Brown in 26th. There was an extra bonus as Alice Burnhope was awarded with a silver medal in the under 20 category with Katie Lord just missing out on a medal in fourth. Athletes from Cannock and Stafford Athletic Club were in fine form last weekend when they contested the Staffordshire Schools Cross County Championships at Rodbaston College in Penkridge coming away with two individual champions and several minor medals for other athletes. This meeting is also selection for the All England Championships in March. The Senior Girls had five C&S athletes competing. Katie Lord of Walton High crossed the line in first place after a strong run and there was a bronze medal for fellow Walton High athlete Rebecca Brown. These two were followed by another Walton member Rachael Jones in fifth, Libby Dunne from Cardinal Griffin in Cannock sixth with another Walton High athlete Giorgia Chattwood eighth. The year 10/11 Inter Girls also saw a club athlete take gold and the individual title. Iris Davies of Sir Graham Balfour produced a solid performance to finish first with East Staffs club mate Josie Nelson taking an excellent bronze medal. Allegra Soutar (King Edwards) came fourth, Molly Shermer (Walton High) 11th, Charlotte Harries (Stafford Grammar) 14th and Faye Evans (Stafford) 22nd. In the Senior boys race there was a silver medal for Sam Bagley (Cannock) with Ryan Ashforth sixth. The year 10/11 boys saw a another bronze medal for Bill Chesters of Alleynes Stone followed by Connor Mills (Cannock) eighth, Tom Clayton (Alleynes) 13th and James Boote 17th. There was another bronze medal for Thando Hart of Walton High in the year 8/9 girls with club mates Amany Williamson (Alleynes) 14th, Ella Sandy (Walton) 24th and Brooke Paintain (Cannock) 21st. In the Year 7 girls there was yet another bronze medal for Stone’s Jasmine Lovatt followed by Daisy Aspinall (Stafford Prep) in 5th. The year 8/9 boys had Tom Brownsill (Stafford Grammar) 5th, Christian Roe, also Grammar, 16th, Jack Sandy (Walton) 17th and Edan Dollochin 43rd. Finally the year 7 boys saw Jake Darnbrough finish in a respectable 7th place. Stafford and District took three team titles with the year 10/11 girls, year 8/9 boys and the sixth form senior girls who were all Walton. An impressive number of C&S athletes made their way to Sheffield on Sunday for the Sheffield Festival of Athletics. In the 60m, Ross Goode, running in only his third competitive race, recorded 7.88 in the 60m. Cameron Futers ran 8.11 in the same race. Also in the 60m, Chloe Lindop equalled her pb of 8.24 secs. James Malpass had a busy day. He won silver in the U15 long jump with a pb of 4.81, he had to come away from the high jump to compete in the 200m after equalling his pb of 1.35M and then he smashed his 200m pb by almost 2 seconds, running 26.48. In the 400m, Rodders clocked 54.61 and Stephen Terry-Short 60.57 in the men's races whilst four of our women dipped under 60 seconds. Megan Davies won gold in the U20's in 56.25 and Chloe Wilde bronze in a pb of 59.22. Chloe was involved in a great race with Natalie Ainge who finished fourth of the Senior Women with a new pb of 58.72. Hannah Malpass just missed out on the U20 medals after running 59.58 in her race. Becky Lawley began the season with an excellent 5.02m long jump. There was fun during the 200m races as the fire alarm went off and the building was evacuated for ten minutes. Fun for everyone except for Cameron Futers that is, who was on his marks to start his race when the alarm sounded. Least to say, he was not best pleased! In the races, Allee Rigby ran 24.23, Cameron Futers 25.72, Ross Goode 25.00, Stephen Terry-Short 26.38, Chloe Wilde 27.11, Natalie Ainge 26.83, Emily Belton 26.33, Hannah Malpass 26.1 and Chloe Lindop 26.6. Our U17W team came a respectable 7th at the Midland Cross Country Championships in Loughborough on Saturday. Iris Davies came home in 17th position and was supported by Libby Dunne in 29th, Giorgia Chattwood 31st, Allegra Soutar 33rd and Jazmin Maddocks 44th. We had two athletes in the U20W race. Katie Lord came an excellent 7th and Becky Brown a fantastic 13th. On Sunday 22nd January Midland Masters held their Cross Country Championships at Aldersley Stadium Wolverhampton. Conditions were cool but dry and mainly firm underfoot. Our women, racing over 6k, excelled. They were led home by Sue Kneill-Boxley in 28.30 mins for individual 2nd in the W50 age group. Christine Kilkenny, running for the first time in a long time, ran 31.24 to win her age group (W60) and it was good to see her back in action. Dot Fellows won the W70 age group in a time of 33.13. As a team they had to run in the W45 age group (this is veteran athletics) and they came away with team gold. Our men’s team were racing over 8k and were led home by Craig Pearson running in his first Masters Cross Country Championships. Craig placed 6th overall (2nd M35) in a time of 29.50 and he was well supported by Nigel Haycock who was 2nd in the M45 age group in a time of 30.36. Paul Thacker was our 3rd finisher in 32.03 (5th M45) and Paul Lester bought the team home in 33.11. (7th M45). This gave them the team silver medal in the M35 category (4 to count). Had they run as a M45 team (3 to count) they would have won team gold but their failure to declare a team before the event meant that they were placed in the M35 group. The club's presentation evening took on Saturday (21st) at Stafford Rangers FC. Once again, there was a great turnout to acknowledge the club's and the club's athletes achievements during the past season. In the Veterans category, in track and field there were medals at British Championships for Tracey Bosworth at the indoors and Emma Hollinshead, Paul Edwards, Terry Faulkner and Martin Roberts at the outdoor championships. Dot Fellows won the British Masters Cross Country title and was selected to represent England in the British & Irish Masters Cross Country International where she also won. The C&S team of Nigel Haycock, Paul Lester and Paul Thacker also won gold in the team event at the British Masters Cross Country Championships and Les Green won a gold in the British Masters Half Marathon Championships. We had three athletes at the World Masters Championships in Australia with Emma Hollinshead finishing fourth in the 800m and reaching the final of the 400m, Chris Hollinshead finishing 6th in the half marathon and Les Green taking part in the cross country, 5000m, 10000m and half marathon. You might think that’s a lot to do but, for those of you who don’t know him, it’s more impressive because Les is 78! Moving onto other age groups, James Boote, Iris Davies, Katie Lord, Becky Brown, Libby Dunne, Mollie Shermer, Georgia Chattwood, Josh Ward, Sam Bagley, Harrison Hardy-Smith, Thando Hart and Josie Nelson represented Staffordshire at the English Schools Cross Country Championships and Jazmin Maddocks was selected for Shropshire. Our Senior Men’s team won promotion back to the first division of the Birmingham and District Cross Country League as Champions of Division 2 with Chris Perrin finishing in joint first place in the individual standings. In the WMYACCL, Josh Ward finished second in the U15 boys competition. It was a successful season for our women in the North Staffs Cross Country League. We finished as Division 2 Champions, Katie Lord came 3rd in the Senior Women placings and 2nd in the Junior Women, Nina Skilton came second in the Vets 45 age group and Sue Kneill-Boxley won the Vet’s 50 age group. On the track, at the National Indoor Championships, there was a bronze medal for Amy Pye and, at the outdoor Champs in Bedford, there was gold for Beth Rees in the javelin and a silver and bronze for Amy over the long and short hurdles. Chloe Wilde was chosen to represent Staffordshire in the Senior Inter Area competition that was incorporated into the England Athletics Senior Championships. We had thirteen athletes chosen to represent their counties at the English Schools Track & Field Championships:- Emily Belton, Megan Davies, Chloe Wilde, Chloe Lindop, James Taylor, Katie Lord, Josh Ward, Dan Fitzhenry, Bethan Rees, Amy Pye and James O’Brien for Staffordshire, Hannah Malpass for Shropshire and Olivia Corcoran for H&W. Beth went on to represent English Schools in the SIAB meeting (where she won) and was also chosen to represent the North West at the Sainsburys School Games along with Amy. Beth also became the Welsh U20 Javelin Champion. During the season, four of our relay teams took part in the Club Connect relays at the British Championships which was a really good evening out and our U20W relay team of Chloe Lindop, Megan Davies, Chloe Wilde and Hannah Malpass won their race. Two of our athletes were selected to represent GB U20s at the Manchester International, Bethan Rees and Megan Davies. David Sunderland Memorial Award - Again this season, this trophy was awarded to a longer distance runner, Nigel Haycock. Nigel gained two club records this season in the 800 and 1500m as well as winning the Midlands 10 mile Championships and showing massive improvements in his performances for the club in track, road and cross country events. Most Improved Young Athlete of the Year – This award is voted for by the club’s coaches and is presented to the athlete who, in the coaches’ opinion, has improved the most over the year. Once again, there was no shortage of strong candidates this season and, for the first time since this award was introduced, we had joint winners, Jack Turner and Becky Lawley. Both of the winners throw the hammer. Jack improved his pb by over 17m and Becky by over 11m. Jack also significantly improved in shot and discus whilst Becky massively improved her long jump pb from 4.42m to 5.13m. Presidents Cup – This trophy is awarded by our President, Bob Hughes, and he awarded it to two people who he felt have raised the profile of the club over the season. This season, the award was shared between Mark Pinner and Bethan Rees who, during the season, were rarely off the front page of the website and social media and appeared in AW as well as regularly in the local press. They achieved excellent results, winning England Athletics, English Schools and Welsh Championship titles, amongst other awards, and gained selection for GB U20s and the Welsh team. Congratulations and thanks must also be given to Sandi Thompson who organised a great evening. Athletes from Cannock and Stafford Athletic Club enjoyed success last weekend when they contested the County Cross Country Championships held at Aldersley Stadium in Wolverhampton. The Under 20 ladies were to the front taking team gold plus silver and bronze individual medals for Katie Lord and Alice Burnhope respectively and with Becky Brown completing the scoring in eighth place the team prize was assured. In the Under 15 girls Thando Hart gave a brilliant display of running taking the silver award with team mate Charlotte Harries in 14th. The Under 17 men took a team silver award with all three athletes in the top ten. Bill Chesters finished 5th, Sam Bagley 6th and Connor Mills 9th. The Under 17 women took bronze in the team competition with Iris Davies just failing to take the individual bronze, finishing in fourth place, followed by Giorgia Chattwood 7th, Molly Shermer 16th and Libby Dunne 18th. The Under 13 boys also took bronze in the team result with Tom Brownsill 8th, Jamie Owen 12th, Jake Darnbrough 18th and Edan Dollochin 31st. The Under 13 girls just missed out in the team race finishing fourth with good runs from Jasmine Lovatt 16th, Daisy Aspinall 18th and Lucy Richardson 31st. The Senior men were also in the medals, taking bronze in the team result with Chris Perrin 7th, Philip Wolfe 9th, Craig Pearson 16th, James Perrin 22nd, Greg Beech 26th, Nigel Haycock 27th and Tom Orton 41st. Finally the Senior women just missed out on team bronze finishing fourth, the Under 20s and Seniors combined for the overall senior score so with Katie Lord 11th, Alice Burnhope 12th, and Becky Brown 27th the team was completed with Sally Gray 17th, Sue Kneill-Boxley 28th and Dot Fellows 53rd.